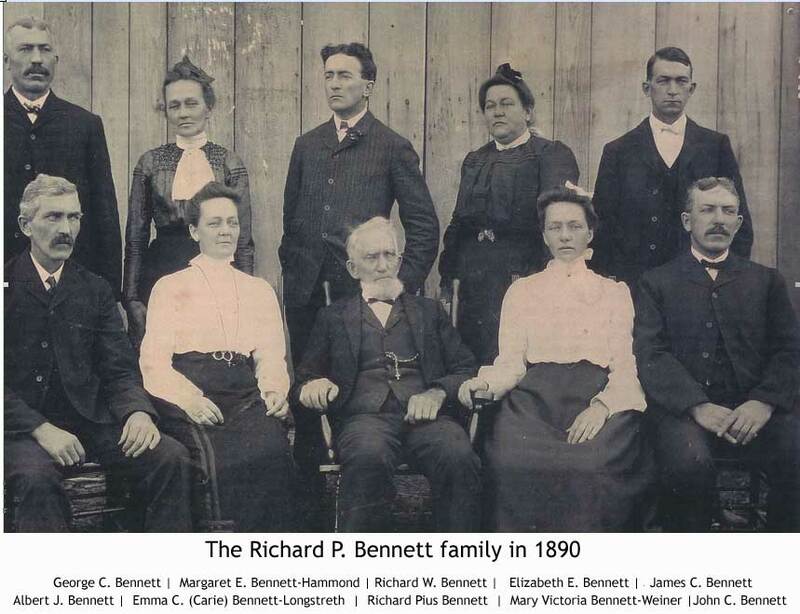 R. P. Bennett was born in Gallia county, Ohio in 1824 and came to this county from Lancashire, England with his parents (Robert Bennett and Cecelia Cuban Bennett) when he was one year old; where he resided until called from earth. In 1853 he was married to Miss Elizabeth McDonald, daughter of John and Margaret McDonald. To this union 12 children were born, nine of whom survive, viz: Albert J. of Junction City; John C. of Wilbren; George C., of this place; Margaret E. Hammond of Columbus; Miss Elizabeth E. of the home; Mrs. Emma Caroline Longstreth of Clayton township, and Mrs. Mary V. Weiner, of San Toy. Mr. Bennett was an honest industrious, upright man, a conscientious and faithful Christian, and commanded universal respect where he was known, and the world is better for his having lived among us for more than four score years. His funeral services were held at St. Rose’s Catholic Church, Monday morning at 10 o’clock under the auspices of the Holy Name Society, of which he was a consistent and loyal member. Solemn requiem high mass was celebrated by Rev. Fr. Cush, who also spoke in eulogistic terms of the virtues of the deceased. Internment in Maplewood Cemetery. As a widower he remarried to Isabell Riffle, ( 3-10-1837 – 11-5-1906). This entry was posted on March 11, 2014 at 8:51 am	and is filed under Photos. Tagged: People, Social. You can follow any responses to this entry through the RSS 2.0 feed. You can leave a response, or trackback from your own site.